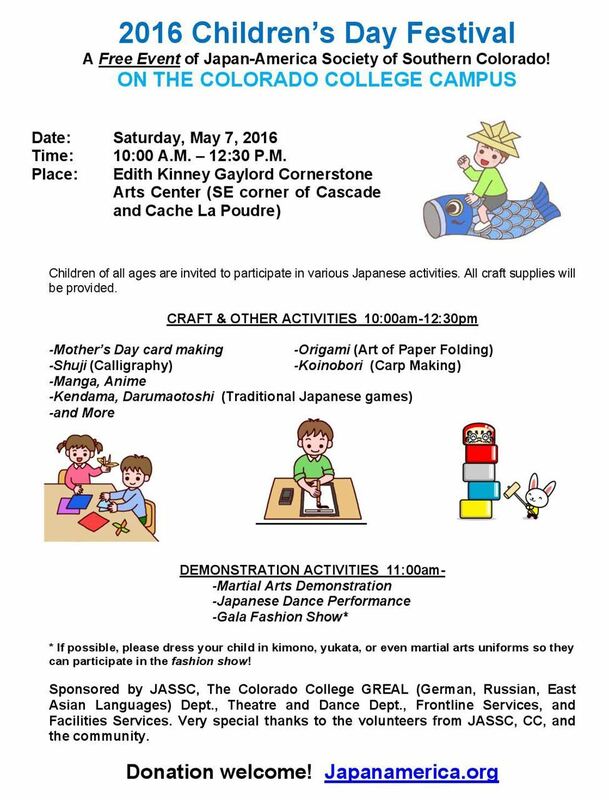 In cooperation with Colorado College, The Japan-America Society of Southern Colorado is hosting the annual Children’s Day Festival on May 7 (Saturday) at the Edith Kinney Gaylord Cornerstone Arts Center at Colorado College from 10 AM to 12:30 PM. Craft activities include origami, calligraphy, kamishibai (picture-story show), Mother’s Day card making, and decorative carp making. Children will also have an opportunity to learn traditional Japanese games like kendama and darumaotoshi, as well as modern Japanese culture through anime and manga. Live entertainment will also be included, with a martial arts demonstration of traditional karate and iaijutsu (swordsmanship), as well as a Japanese dance performance. The final event is a Gala Children’s Fashion Show. All children are encouraged to wear their kimonos, yukata, martial arts uniforms, and other Asian-related costumes so that they can participate in the Fashion Show. Please come and join us in celebrating Japanese culture! The event is free, but donations are welcome.